Six Sigma Training and Certification in St. Augustine. 6Sigma.com pioneered the provision of both Green and Black Belts together for the first two weeks in St. Augustine. This left trainees with more time on hand while corporates were left with far greater flexibility than in the past. A distinct advantage to corporates in St. Augustine is our provision of a whole host of onsite Six Sigma Champion leadership courses for them which makes deploying six sigma principles within their precincts really very simple. The Courtyard by Marriott St.Augustine blends rich texture, captivating design and the most modern conveniences. Located near I-95, at Exit 318, this St. Augustine hotel is just 1 mile from Prime Outlets St. Augustine and St. Augustine Premium Outlets malls. The hotel is centrally located within 10 minutes of many St. Augustine attractions, including Historic Downtown St. Augustine, the Fountain of Youth, the Ponce de Leon bike trail, St. Augustine Alligator Farm, World Golf Village and Flagler College. With all there is to do, your St. Augustine vacation will be one to remember.Courtyard by Marriott St. Augustine is also within minutes of Florida School for Deaf and Blind, Ring Power Caterpillar Corp Office and Ronco Business Solutions. 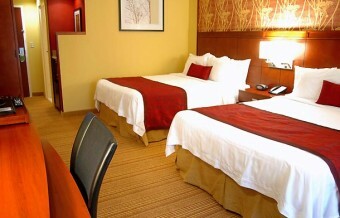 Our spacious guestrooms feature Wi-Fi & hi-speed Internet, deluxe Marriott bedding package, microwave and refrigerator. Maintain your fitness routine in our fitness center or in our outdoor heated pool. Meet friends for breakfast or dinner in our Bistro.